Here are some great ideas for Transition Activities. 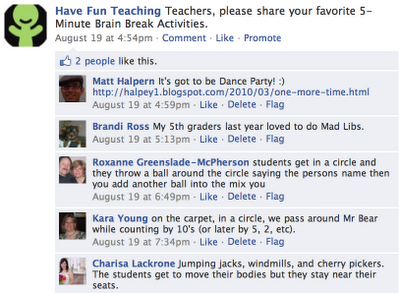 These 5 minute brain break activities come straight from real teachers on the Have Fun Teaching facebook page. 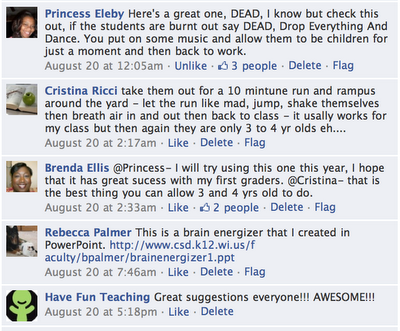 These are all great ideas for end of the day activities and five minute brain breaks. It's Got to be a Dance Party!...I love it!!! 1. Counting Songs for Transition Activities - These counting songs are great repetition and great practice for skip counting during a transition or brain break activity. 2. Fitness Songs for Kids - These fitness songs and movement songs for kids are perfect for getting your students' brains working again and getting them active during a transition.